This is where sensors are added to the model and configured. Up to 32 sensors may be managed. FrSKY sensors are added from the telemetry screen. Telemetry units and decimal precision are automatically configured for FrSKY sensors. Their minimum and maximum values are also automatically tracked. Individual telemetry may be reset using a special function. All telemetry may be reset using a special function or from the main view and telemetry view context menus. Settings such as sensor name, auto offset, filtering, persistent storage at power off, turning logging on and off are configurable. Note that for logging to work logs have to be configured on the special functions screen as well (more…). Duplicating sensors are allowed and each copy may have different configurations. For example their units may be changed so that one sensor may have its units in meters while another copy of it has it in feet. Another example is to configure them so that one sensor gives the altitude above sea level while the other gives the altitude relative to ground. Multiple identical physical sensors are supported as long as they have a unique instance number. For example an FrSKY current sensor by default usually has an instance number of 3. An FrSKY channel changer may be used so that a second current sensor has an instance number of 13 (more…). These two current sensors may now be used together. 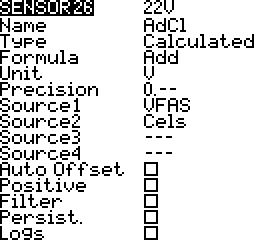 Calculated sensors use one or more sensor to calculate a value. For example a current sensor may be used to calculate the mAH used. Another example is adding the voltages from two different voltage sensors. There two examples can be combined to calculate power (voltage x current). The power density is proportional to 1/distance squared. For every 6dB change the power density changes by 4x. So 6dB change occurs with 2x distance change. For every 6 dB loss in RSSI there is a doubling of the distance. 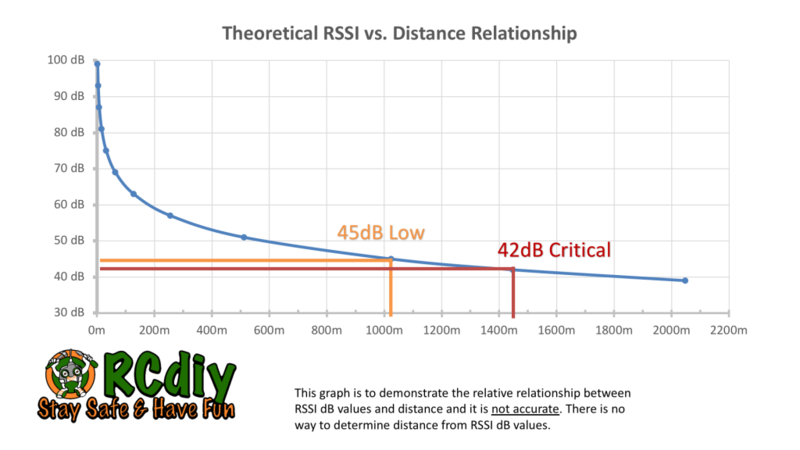 For every 3db loss in RSSI there is a 1.4x change in distance. For example if a signal low warning is heard at about 1 km then it is likely that the RF signal critical warning will be heard at 1.4 km and possible control loss will occur by the time 2 km is reached. When the RSSI value goes below these values (45 and 42) an audio alert is heard. It is recommended that these values be kept unchanged. The RSSI low and critical alerts will not occur. When loading the model a warning will be displayed. A list of sensors connected to the system. Sensors may be selected and edited. Line Number: A number assigned similar to a numbered list. This helps distinguish duplicate sensors. Name: The name as it appears is source lists. Value: The sensor value with units. Telemetry Received: Values recently received. May blink if the update is slow. Will disappear if no updates. Sensor Lost: Connection to the sensor has been lost. Turn on discovering new sensors. Add a new custom or calculated sensor. Delete all the sensor in the sensor list. To be used with non FrSKY sensors which may have faulty software that fills up all the sensor slots. In Companion this is called disable multi sensor handling. This is rarely needed. The sensor being used for the variometer. The climb and sink range within which to change the variometer tones. The range within which to ignore climb and sink. Play a tone or stay silent within centre range. The name as it appears is source lists. Each sensor has two auto generated sensors for their minimum and maximum values. They share the same name with a negative and positive symbol added to the end. Minimum: An auto generated sensor minimum value variable that appears in the source lists. Maximum: An auto generated sensor maximum value variable that appears in the source lists. The settings available and their behaviour change depending on the type of sensor. Sensor that are automatically added by discovery are custom sensors. Their configurations are automatically added and do not usually need to be edited. Calculated sensors use one or more sensors to provide telemetry based on the sensor values and a calculations. 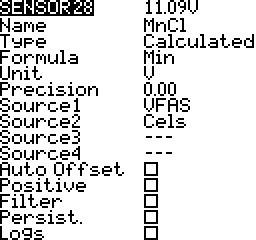 There is more information in the calculated sensors section below. Hardware ID Number – This unique to sensor type. For example 0210. These do not need to be unique. More than one sensor of the same type may be connected. For example two voltage sensors. Hardware Instance Number – This is assigned in the sensor hardware. For example the FrSKY current sensor has a voltage sensor with an instance number of 3. For FrSKY sensors this may be changed using an FrSKY servo channel changed (more…). When using two sensors of the same type this instance number must be different on each sensor. There are a number of formulas that are available. 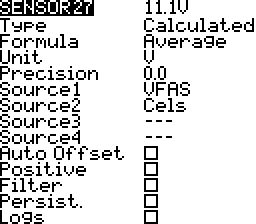 These are covered in the calculated sensors section below. The units of the sensor values. There are over twenty units available. Some examples are meters (m), kilometers per hour (km/h), feet (ft), and fluid ounces (fOz). These units are important for display and audio announcements of sensor values. The number of decimal places to display. The value is not rounded; Digits are truncated. Only use positive values. If the values are negative return zero. Used to smooth values that change a lot. Values are averaged over the sensor’s last few reported values. Values are retained between model changes and power cycles. The next time the model is loaded the last recorded sensor value is retained. For example the last mAh is added to the present mAh calculations to get a total over multiple flights. 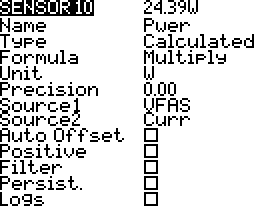 Select the Variometer source and settings. A variometer provides a glider’s sink and climb rates using an altitude sensor. As the aircraft sinks and climbs a tone is heard and its pitch changes. The range within which to change the variometer tones. Sink and climb rate limits when the tone pitch change stops. Beyond these limits the tone stays the same. The units are that same units as the variometer source; meters per second or feet per second. The range within which to ignore climb and sink. When the climb and sink rates go outside these settings the tone changes pitch. The units are that same units as the variometer source; meters per second or feet per second. Add telemetry source values. Up to 4 sources. For example add individual cell voltages to get the total voltage. Average telemetry source values. Up to 4 sources. For example the average voltage of individual cells. Minimum value from source values. Up to 4 sources. For example the minimum voltage of individual cells. Maximum value from source values. Up to 4 sources. For example the maximum voltage of individual cells. Multiply two source values. For example current multiplied by voltage to give power in watts. 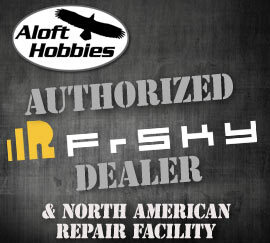 This is for the FrSKY lipo sensor that connects to the lipo balance connector. Volage of a particular cell. The difference in voltages between the highest and lowest cell voltages. The mAh used based on the current sensor values. 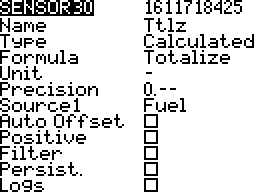 Telemetry initial reference values and minimum and maximum values get reset. Calculated sensors such as height above ground calculate their values with respect to the value at reset. Consumption sensors such as mAh consumed get reset to zero. The GPS pilot latitude and pilot longitude get reset to the current position. 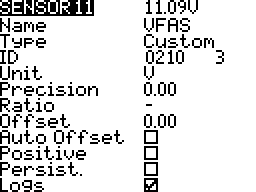 Minimum and maximum values get set to the sensor’s current value. Telemetry switches are active when telemetry data is being produced. These switches are used on model menu special functions and logical switches screens as an activation switch. A special function could be configured so that when the GPS altitude sensor is sending telemetry have its value announced every fifteen seconds. When there is no telemetry yet or telemetry has been lost do not announce its altitude. Switch inactive: GAlt telemetry not being received, no announcements. Switch active: GAlt telemetry being received, announcements every 15 seconds. A logical switch could be configured so that it is true only when the throttle is not idle and telemetry is being received. This logical switch could then be used in a special function to announce telemetry values. This could be one way to only have announcements while the aircraft if flying and not on the ground. Switch inactive: Throttle is idle or telemetry is not being received. Switch active: Throttle is not idle and telemetry is being received. Lipo voltage being measured 3S-5S using the FBVS-01 voltage divider. Sensor voltage divider ratio is 6:1 @ the 3S setting. Using a multimeter measure the voltage. If the multimeter voltage and sensor voltage do no match adjust the ratio until they match.